Just wondering if anyone had the opportunity to test the new WIMBOOT windows 8.1 feature? It seems there is a new DISM command line flag (/wimboot) to capture/apply WIM files. The benefit on storage looks obvious but I am wondering about the performances (IO anc CPU). * WIMBoot is available only for UEFI-based PCs running in UEFI mode (legacy BIOS-compatibility mode isn't supported). * WIMBoot is supported for solid-state drives and eMMC (Windows HCK compliant) drives. WIMBoot isn't supported on traditional drives that contain rotational components, or on hybrid drives that contain both solid-state and rotational drive components. WIMBoot works by taking advantage of the capability of solid-state drives to access different areas of the hard drive quickly. I'll watch this space with interest as sadly I can't play - I can't meet the hardware requirements! Googling around it seems that the UEFI and SSD requirements are actually only recommendations. I'll try to set some hardware at home and play with it these next days. Are you using UEFI or MBR? Are you running X86 or X64? Are you using SSD or not ? As a whole, did you save lots of space? Any downside on the performance side? note : the "DISM Image Management Command-Line Options" MS web page has been updated on April 1st to reflect the /wimboot new flag. Edited by azlvda, 12 April 2014 - 11:11 AM. The X86 is already one good news (x64 is not mandatory then). I am burning a Win8.1 update media as we speak. My test hardware will be an old Lenovo T60 from 2006 with a 80gb SATA drive. Please feedback as I have a similar piece of kit I can use for testing - if your setup works then my slightly newer (refurbished) Lenovo T400 should also work. My T60 would not let me use my x64 iso. I also have a T400 : this one should be no pb at all. Windows 8.1 update X64 installed on a Lenovo T61. Wosk fine. Now I guess I need to capture to a wim file using /wimboot and apply it back using /wimboot to test this new wimboot feature. so far, no luck with /wimboot flag. My OS is windows 8.1 x64 update 1, my drive is SSD. But my bios is not UEFI and I am using a MBR partition : could be a limitation. Actually the wimboot flag works now. Using process monitor, I was able to spot that DISM was looking for windows\system32\wimbootcompress.ini within the folder i was trying to capture (c:\my_folder\windows\system32\wimbootcompress.ini). Looks as if this flag was meant to capture a drive only and not a folder on a drive. Creating windows\system32\wimbootcompress.ini in my to be captured folder did the trick. Will now follow a proper procedure. 1-I made a WINPE out of the Windows 8.1 x64 update 1 iso (I used QuickPE). 2-I booted onto this Winpe. 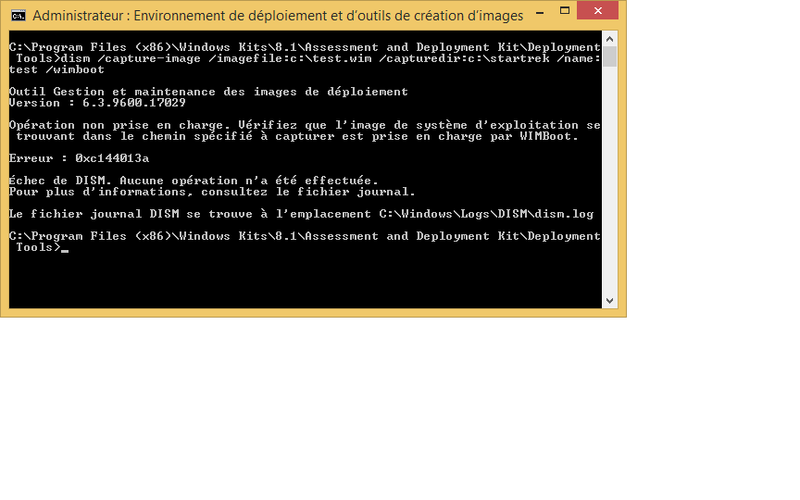 3-I captured my installation : dism /capture-image /imagefile:e:\install.Wim /capturedir:c:\ /name:install /wimboot. 4-I formatted my C drive. 5-I applied my wim file to my C drive : dism /apply-image /imagefile:e:\install.Wim /index:1 /applydir:c:\ /wimboot. 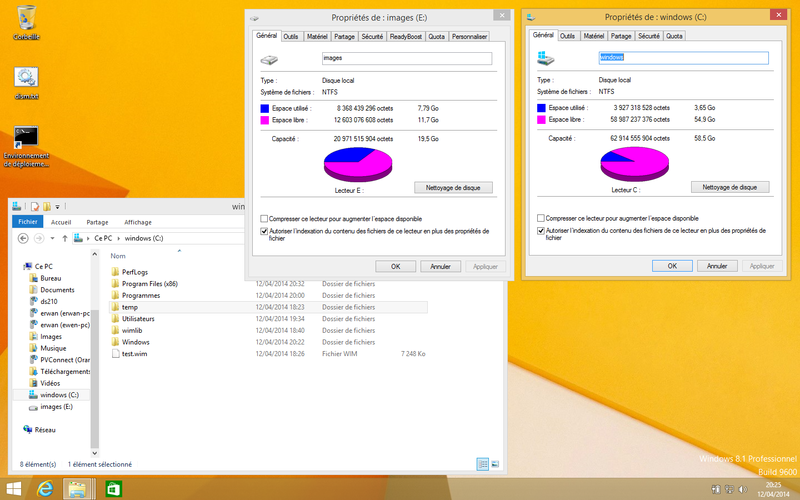 And voila Only 3GB occupied on C drive (17gb originally) and my files pointing to the wim file (8gb) on the M drive. edit : attaching a picture (from MS) adpated / simplified to explain my setup. 1. Using the "Original" i.e DISM method : here. 2. Using the "GUI" i.e CloneDisk method : here. 3. Using the "Alternative" i.e WimLib method : here. This (still) looks interesting. Unfortunately I do not think I have access to the required Windows 8.1 update 1 sources as I'm running the Enterprise Evaluation version of 8.1 and update 1 does not appear to be available via automatic updates. Will report back later if I don't hear from anyone before the download and installation completes. P.s. Thanks erwan.l - if I am downloading the relevant .iso then I'm sure your instructions will prove useful. It's nice that someone else has gone through the pain so that I don't have to! 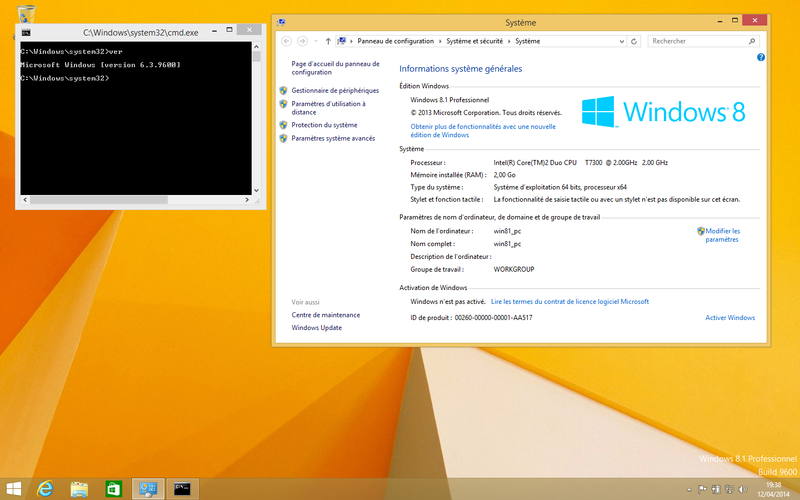 My windows 8.1 U1 x64 source is 6.3.9600.17031. This is a quick report. It (eventually) worked - woo-hoo! On rebooting to WinPE 3.1 and checking the boot files on the Windows 8.1 Update 1 drive (hd0,1) they were all zero byte files in terms of size on disk (this was after the files had been captured and then applied with the wimboot flag). After playing around for a while with different active partitions, booting via grub4dos, booting directly with bootmgr (or at least attempting to) I found a method that worked for me. I reapplied the wimboot Windows 8.1 files to (hd0,1), then copied bootmgr and the bcd store from (hd0,1) to (hd0,0), then booted grub4dos on (hd0,0) and ran chainloader (hd0,0)/bootmgr. I'm writing this on a wimbooted Windows 8.1 Update 1 system (x86 Enterprise Evaluation). I used the DISM method for this test as it's known to be working. I'll retry with wimlib when I have the time to do so. Just out of curiosity, do you have a seperate boot partition? And do you use a third party bootloader/bootmanager? I might try this experiment again with a seperate boot partition during the installation phase of Windows 8.1 Update 1 - before capturing and reapplying. One note thus : it seems that I have to perform a bcdboot c:\windows /s c:\ after each apply. But it could be that my initial capture was missing a working BCD. Note the --wimboot, not –wimboot. The same correction needs to be made to item 5 (Apply our wim file) - also I believe that an image number needs to be specified in this command. It may also be worth stating in your instructions (for both the DISM and Wimlib methods) that the bcdboot command (bcdboot #:\windows /s #:\ - where # is the volume containing the applied wimboot files) needs to be applied. I doubt that both you and I would both have the same problem with BCD store not having been captured properly. It is clearly not there - just linked to. I suspect the bcdboot command physically copies the required files to the volume - I'll check this out shortly. Thanks again for taking the time out to document your experiments. It is clearly not there - just linked to. Just in case, check the file extents for the file, with the blocklist command. I'll have to reapply the wim file first. Will check this later and report back.